Across the street from George Lane Beach Park at the corner of Thorndale and Sheridan Road stands a handsome mansion designed by George W. Maher. Maher was born in West Virginia, attended elementary school in Indiana and after his family moved to Chicago, began work at the age of 13 in the offices of Augustus Bauer and Henry Hill. At the age of 61, he took his own life, but not before designing over 270 projects that incorporated both the Arts and Crafts and Prairie Style elements. His son, Philip B. Maher, who took over his father’s practice upon the elder Maher’s death is responsible for some of the great Art Deco designs that contributed mightily to the magnificence of the mile on the north side of the DuSable Bridge. The Edwin Colvin house at 5940 North Sheridan Road was finished in 1909 and was built for the vice-president of the W. F. Hall Printing Company. Edwin Colvin was born in 1867 in Buchanan Michigan and moved with his family to Ohio and Kentucky before finally apprenticing himself to a Michigan printer at the age of 14. Four years later he headed for Chicago where, after a series of jobs in the industry, he joined W. F. Hall in 1899. How about that? The architect began his working life at the age of 13 . . . the printer at 14. I would imagine they understood each other pretty well. 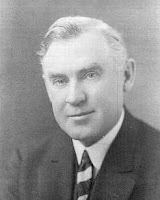 In 1908 Mr. Colvin and Robert M. Eastman purchased W. F. Hall upon the death of its founder, William F. Hall. Mr. Eastman assumed the role of President while Mr. Colvin served as Vice-President. Mr. Colvin also served as Vice-President of the Central Typesetting Company and as President of the Photoplay Publishing Company. Photoplay Magazine, by the way, is considered by many to have founded what now we call celebrity media. As early as 1918 the magazine had a circulation of over 200,000, and it became even more popular in the 1920’s and 1930’s. W. F. Hall was begun in 1892 by its namesake, William Franklin Hall in what is now Printer’s Row. In 1908 the concern moved north to Chicago and Kingsbury and at one time employed over a thousand workers. In 1916 the plant, which was enlarged in 1918, produced 15,300,000 magazines, 14,245,000 periodicals, 12,248,000 catalogues, and 21,950,000 supplementary catalogues. The production required 56,583,000 pounds of white paper and 885,000 pounds of ink and averaged a daily output of 188,610 pounds of catalogues and magazines. It appears that Mr. Colvin was doing fine. The mansion on Sheridan Road, although it is one of the few survivors on the street from the glories of the first part of the twentieth century and cries out for attention, is a striking combination of classical forms and the horizontal rhythms of the Prairie Style. One cannot help but notice that classical dormer two stories above the imposing front entrance, also classically designed – and on either side of the entrance . . . those planters could have come directly from the studio of Joseph Lymon Silsbee at which both George Maher and Frank Lloyd Wright worked. The long, low elevation of the home as it faces Sheridan Road is a classic Prairie Style design, complete with its broad, overhanging eaves and yellow Roman brick. So is the low hip-roof out of which that classical dormer protrudes. The arched front entrance and the brick-lined porch reflect the Arts and Crafts emphasis on natural materials and artistry in construction. Especially striking is the Thorndale or south side of the house where in one sweeping arc the first floor cornice meets the port cochere and continues on to incorporate the three bays of the garage in its organic form. I'm thinking it’s a beautiful way to come home on a rainy night. There appears to be some work that is going on at 5940, but a heck of a lot more needs to be done, judging by the look of the lot and the way the concrete is crumbling, especially at the front and rear entrances. It’s a handsome home, one worth investing in. This is what wealth looked like back when Chicagoans were still trying to figure out how to get across the river.